Voyage d’Hermès has come to be known in the fragrance world as, “did you see that bottle?” Or at least, that’s what I call it. It’s the perfume with the fantastic bottle. The juice inside is pretty good too. In Bottle: Bright green citrus. Lime most of all, with a distinct sourness to it. This smells like lime rinds, okay? And I love it. Applied: That initial citrus, green and dry with a hint of sourness edges into a steadily rising spicy mid-stage where ginger greets you and takes you to meet its friend cardamom. The two of them hold you there, complementing each other with the fading lime rind as the fragrance’s rind opening gives way to a sheer floral headed by those spices you met earlier. The fragrance then dissolves into a white musk dashed with a bit of woodsiness that grows stronger and stronger as the spices start to fade away starting with ginger then cardamom. The final stage is marked with a pretty white musk and fading traces of woodsy notes. It should be noted that Voyage d’Hermès is not a heavy scent. It is extremely sheer so if you’re looking for power and projection, this is not your stuff. Extra: Voyage d’Hermès was composed by the much esteemed Jean-Claude Ellena whose rapsheet also includes Kelly Caleche and Terre d’Hermès. Design: I’ve got to spend a little time talking about this bottle. I love it. The design, the quirky swivel. The fact that it’s minimalist but elegant and modern. The inner glass bottle contains the juice itself, but it also has an outer metal casing that swivels. What sets this outer metal casing apart from other perfumes of glass and metal is the fact that the casing acts both as a cap and a stand. It’s a little functionality for your fragrance that beats the gold plated stuff that simply serves to be flashy. Did I mention an added bonus feature of this bottle? It’s refillable. Immediate points given for that, Hermes. It looks good. It functions well. You can refill it. It’s just fantastic. Notes: Lime, juniper, green tea, pepper, ginger, cardamom, cedar, sandalwood, amber, white musk. Hermes has always done some beautiful work with their fragrances and I particularly must give props to Jean-Claude Ellena. The man has made some fabulous perfumes in his time and Voyage d’Hermès is one of them. Neither too abstract or too derivative, Voyage d’Hermès is in that beautiful little middle ground where balance is key. 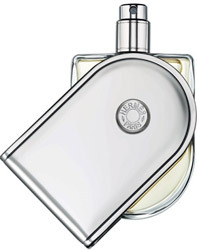 Reviewed in This Post: Voyage d’Hermès, 2010, Eau de Toilette. This entry was posted in fresh, hermes, Reviews By House, spicy and tagged amber, cardamom, cedar, ginger, green tea, juniper, lime, pepper, sandalwood, white musk. Bookmark the permalink.